By Lisa Katayama 11.26.07 | 4:00 PM Lisa Katayama: "Once I'm all wired in and gelled up with an EEG cap, a researcher places a magnetic stimulator on my head and starts zapping my brain as part of a memory experiment." SAN FRANCISCO -- I feel like the hoodlum Alex in Stanley Kubrick's A Clockwork Orange : My head is held steady by a chin strap, while two technicians grease my scalp with conductive gel and slip on a cap bristling with electrodes. I'm about to have my brain scrambled -- electrically -- in the name of medical science. Scientists are going to knock out regions of my brain while I perform a memory test. "We're ready to do some zapping!" one of the technicians says excitedly. I'm a guinea pig in a brain-scan experiment conceived by neuroscientist Adam Gazzaley , who is testing how memory changes with age. The "zapping" induces seizures in some subjects and cures depression in others. I don't know what it will do to me, but I'm about to find out. Brain experiments are a dime a dozen these days. But Gazzaley's experiment is the first to combine three brain-scan technologies in one study: functional magnetic resonance imaging (fMRI), electroencephalography (EEG) and transcranial magnetic stimulation (TMS), which will knock out some of my memory circuits. "Gazzaley's research is cutting edge," says Suzanne Corkin, an MIT neuroscientist. "Most cognitive neuroscience labs do not have the equipment and technical knowledge to apply all three methods." Gazzaley directs the new imaging center here at the University of California, San Francisco's Mission Bay campus . He's testing a theory that we forget things with age because we remember too much. We can't find the important stuff among all the junk. He hopes to identify and isolate the precise neural networks that determine how we remember some things and ignore others. The experiment could provide important insight into a wide range of age-related memory conditions, including attention deficit disorder and obsessive-compulsive disorder and aging. "We'll learn how the young brain works, how this changes through aging, and maybe guide new therapy programs to improve these abilities as they change with age," explains Gazzaley, a 38-year-old New York City native. Gazzaley is studying the brains of 40 volunteers: 20 younger subjects who -- like me -- are between 18 and 35, and 20 older adults between 69 and 75. The study is split into two phases: First, to locate the neural memory circuits, Gazzaley uses fMRI , a neuroimaging technology that detects blood flow. During a battery of memory tests, the technology indicates which parts of my brain are active while I try to remember and ignore certain information. In phase two of the study, he applies EEG to record my brain's electrical activity, while simultaneously scrambling my memory circuits using TMS, which suppresses neuron activity with rapidly changing magnetic fields. If I do comparatively poorly on the test while one part of my brain is scrambled, it's likely those circuits contributed to memory function. So, in phase one, I lie on a cold white plank inside a giant, donut-shaped Siemens Tesla fMRI scanner. The room is dark. Giant headphones, restraining foam pads and strict orders not to move have me quite literally in a bind. A mirror, situated at a slant directly above my head, reflects a flat screen showing a short film about pink flamingos. As the machine pulsates steadily, a woman's voice announces through the intercom: "We're starting." A loud beeping noise like an emergency alarm pervades the room. The words "GET READY" appear in bright green letters across the screen. My anxiety is replaced with determination: I want to beat this brain game. Black-and-white photographs of grim faces and nature scenes (many of which Gazzaley took himself ) flash before me. I click the right button for photos I've seen before and the left button for the ones that I don't remember seeing. I'm instructed to either ignore faces or scenes. It seems simple, but it can be confusing. An hour and 40 minutes later, I leave the scanner feeling cold and stiff. Its magnetic field -- 3,000 times stronger than the earth's -- made me drowsy. A research assistant shows me a picture of my brain ("It looks pretty normal"), and gives me $60 for participating in the trial. 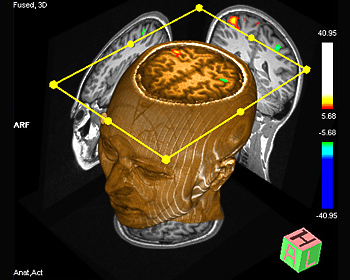 "The fMRI generates maps of my brain such as this one, which shows the regions I used during a memory game I played as part of the trial." Phase two: A week later, a man is measuring my head. Then he draws a pink dot on my forehead and brushes my hair. "I am abrading your scalp so we can get a better connection," he explains. He's referring to the 64-channel EEG cap that will record my brain's electrical activity. On my right, a computer screen displays my brain from five different angles. Different areas of it are colored purple, yellow, green and red. Sensors near my eyes and ears are equipped with amplifiers that connect through fiber-optic wires to a digital box where analog brain signals are digitized using software called Analyzer (and some proprietary scripts). I don plastic goggles (festooned with what appear to be small disco balls), which triangulate my exact position. Once I'm wired in, the technician takes a giant blue gadget that looks like the head of a vacuum cleaner -- the TMS -- and points it at my head. Using a method called fMRI-guided stereotactic localization, Gazzaley's researchers scramble my prefrontal cortex to see how I do during a battery of memory tests without access to some of my neural networks. Four hours later, I finally leave the nondescript UCSF office, this time feeling groggy and crampy. I don't know if it's from sitting in that uncomfortable contraption or from the brain scrambling. Another week later, Gazzaley shows me a simple bar chart on his desktop. "As you get older, you have a harder time ignoring information," he explains. "Your data shows that you're really good at ignoring and remembering." Another chart mapping the performance of older people at memory tests shows they didn't do as well. "The old have a problem with this. They don't modulate as much ... they have a harder time ignoring information." With the myriad of variables that can influence the results -- tiredness, machine noise, motivation, slippery fingers -- it's impossible to tell whether I truly have a better short-term memory than the next guinea pig my age. But Gazzaley hopes that when he has enough data to publish, he'll be able to say something meaningful about memory. Corkin thinks he's on the right track -- and that we'll likely see more studies combining various brain-scan technologies. "Multimodal experiments in humans will expand knowledge in all cognitive domains," she says. "These kinds of experiments are highly appealing to funding agencies and faculty search committees."